Cizre (pronounced [ˈdʒizɾe]; Kurdish: Cizîr‎ or Cizîra Botan, Arabic: جزيرة ابن عمر‎ Jazīrat Ibn ʿUmar, Classical Syriac: ܓܙܝܪܐ‎ Gzirā or Gziro) is a town and district of Şırnak Province in the Southeastern Anatolia Region of Turkey, on the border with Syria, just to the northwest of the Turkish–Syrian–Iraqi tripoint. It is populated by a majority of Kurds in addition to Assyrian/Syriac people, Arabs, Turks and Armenians. It is surrounded by the Tigris on the north, east and south; this gives it its name, which means "island" in Arabic (جزيرة, jazīra) previously a geographic reference to all of Upper Mesopotamia in Arabic geographic references. Cizre has a mediterranean climate (Csa in the Köppen climate classification) with wet, mild, rarely snowy winters and dry, extremely hot summers. Daily summer temperatures of 113 °F (45 °C) or higher are common, as well as below freezing temperatures in the winter. During the Early Iron Age, Cizre was in the kingdom of Kumme, north of Assyria. In classical antiquity, it was located in Corduene (Kardu). In 19th century scholarship, it was often named as the location of Alexander's crossing of the Tigris in 331 BC, further identified with the Roman stronghold of Bethzabde (Syriac: ܒܝܬ ܙܒܕܝ‎, Bēṯ Zaḇdai), although Stein (1942) is sceptical of this. Bethzabde was part of the Roman province of Mesopotamia. The chronicler Msiha Zkha speaks of three bishops of Beth Zabdai in the 2nd and 3rd centuries: Merza, Soubha-liso, and Sabtha. In 360 Bishop Theodorus was deported by the Persians, along with the general population, and died as a result of the forced march. Another bishop, Maras, was one of the Fathers of the Council of Chalcedon in 451 and in 458 was one of the signatories of the letter of the bishops of Mesopotamia to Emperor Leo I the Thracian after the death of Proterius of Alexandria. Cizre was home to an Armenian community of about 3,000. However, in late June 1915, during the Armenian Genocide, the Armenian males, along with a few Syriac bishops, were arrested, tortured, and subsequently murdered. Many of the victims had their throat slit and were then thrown into the river Tigris. The women were deported on rafts towards Mosul. A few survived through the means of adoption by local Kurds; however, most were raped and/or drowned. The remaining Armenian population, located in the rural parts of Cizre, was massacred on 8 August 1915. Few managed to survive. 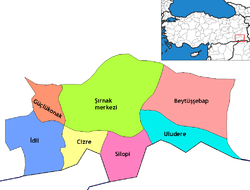 Within the Turkish Republic, Cizre was part of the Mardin Province until 1990, when it was incorporated into the newly established Şırnak Province. Cizre is located on the River Tigris, which forms the border line with Syria at this area. The state roads (via Midyat) and (European route ) (via Nusaybin) that connect Mardin with Şırnak, as well as the route to Silopi run through the town. In October 2014 least 35 people were killed when riots broke out in the city over Turkey’s response to the civil war in neighbouring Syria, blocking Kurdish fighters from crossing the border into Syria. 17 of its citizens who fought with fellow Kurds died in Syria during the Siege of Kobanî. During the Kurdish–Turkish conflict in September 2015, Cizre was blockaded by Turkish Security Forces, who besieged the town and placed a curfew for eight days, after the YDG-H, an organization founded by youth who sympathize with the Kurdistan Workers' Party (PKK), in an attempt at self-rule, had raised barricades, planted explosives and dug trenches in the city. During the curfew the town had limited access to water and food and many of the injured were prohibited to receive professional medical treatment. According to the Turkish government, most of the dead were PKK militants, however, according to the pro-Kurdish Peoples' Democratic Party, 20 civilians were killed. The Council of Europe raised concerns about "disproportionate use of force by security forces against civilians." On 13 December 2015, the Turkish authorities renewed the curfew on Cizre city to repress Kurdish militants. The siege lasted until 11 February 2016. The Turkish Army stated that 659+ PKK militants had been killed during the curfew. By 14 February, 123 bodies were reportedly amassed in local morgues, most of the bodies were reported to have been burnt. On 7 February, a large-scale operation was conducted in the Cudi neighbourhood and a number of buildings were hit by artillery. Turkish army claimed that 10 PKK militants had been killed in the operation, whilst pro-Kurdish sources claimed that those killed were civilians. Pro-Kurdish Peoples' Democratic Party (HDP) claimed that 70–90 injured civilians had been forced to stay in the basements of buildings in Cudi for 20 days. On 11 February, military operations in the city ceased. On 1 March 2016, it was announced that the curfew would end the following day. Human rights groups claimed that 263 had been killed, including at least 92 civilians. By March 2016, residents started returning to a devastated city. According to IB Times, the level of damage to the city was comparable to the Siege of Kobanî. Prime Minister Ahmet Davutoğlu pledged to rebuild Cizre. On 26 August 2016, 11 police officers were killed and 78 other people wounded when an explosives-laden truck was detonated at a police checkpoint about 50 metres from a police station near the town. The state-run Anadolu Agency blamed the Kurdistan Workers' Party for the attack. The former mayor of Cizre, Aydın Budak, was arrested in December 2009 as part of the KCK investigation. In October 2011 he was removed from office by the Ministry of the Interior before his trial had concluded. In 2014 Leyla Imret was elected as mayor. As a 27-year-old woman, she was the first female mayor of Cizre and one of the youngest mayors in Turkey. During the siege of Cizre, she was removed from her post for charges of inciting hatred and supporting terrorism. ^ a b "Turkey and its Kurds: Dreams of self-rule". The Economist. 14 February 2015. Retrieved 20 February 2015. ^ Üngör, Uğur Ümit (2012). The making of modern Turkey : nation and state in Eastern Anatolia, 1913-1950 (1. publ. in paperback. ed.). Oxford: Oxford University Press. pp. 98–9. ISBN 0199655227. ^ Kevorkian, Raymond (2011). The Armenian Genocide: A Complete History. I.B.Tauris. ISBN 0857730207. ^ Korucu, Serdar (13 September 2015). "100 yıllık hikaye: 1915'te Cizre'de ne yaşandı?". Radikal. ^ "Letter to the Minister of Foreign Affairs" (in Turkish). Cizre Ticaret ve Sanayi Odası. November 29, 2005. Archived from the original on March 15, 2008. Retrieved March 15, 2009. ^ Cale Salih, Aaron Stein. "How Turkey misread the Kurds". ^ a b "Turkey: Families return to shattered Kurdish town of Cizre – 'a second Kobani'". IB Times. Retrieved 13 March 2016. ^ a b c "Turkey eases curfew after assault on PKK rebels leaves Cizre in ruins". The Guardian. Retrieved 13 March 2016. ^ "Turkey Kurds: Many dead in Cizre violence as MPs' march blocked". BBC. 10 September 2015. ^ "Turkey 'must ensure access' to besieged Cizre, says Council of Europe". BBC. 11 September 2015. ^ "Number of bodies taken to morgues in Cizre increases to 123". Today's Zaman. 14 February 2016. Archived from the original on February 17, 2016. ^ "Turkey: Deadly Truck Bomb Hits Cizre Police Checkpoint". The Guardian. Guardian News and Media. Associated Press. 26 August 2016. Retrieved 26 August 2016. ^ "Ministry of Interior, the PKK's hidden structure of the city of KCK / TM to begin operations on September 21, was arrested in Sirnak". Haber Monitor. 2011-10-15. Retrieved 2011-10-23. ^ "Carl von Ossietzky Medal Awarded to Leyla İmret". Bianet. 8 November 2018. ^ "Interior Ministry removes Cizre mayor from post". Today's Zaman. 11 September 2015. Archived from the original on 12 September 2015.